Cloudy. Slight chance of a rain shower. High around 50F. Winds N at 10 to 20 mph..
Visitation will be from 4 to 8 p.m. Sunday at Pederson-Volker Funeral Chapel, Chippewa Falls. The funeral service will be at 2 p.m. Monday, April 15, at Central Lutheran Church, 28 E. Columbia St., Chippewa Falls, with visitation one hour prior to the service Monday. Pederson-Volker Funeral Chapel is serving the family. 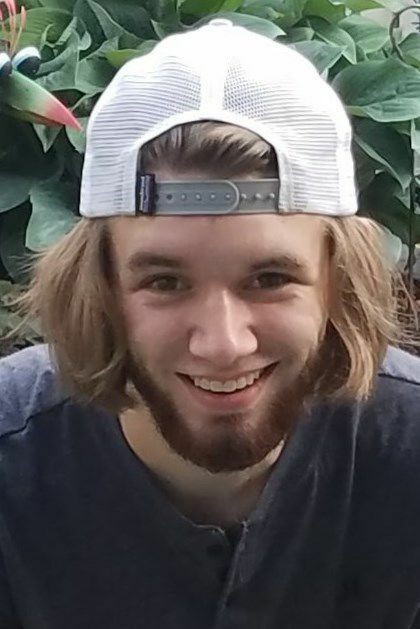 Matthew Jon Hagen, 19, of Chippewa Falls died Tuesday, April 9, 2019, as the result of a car accident. He was born Feb. 18, 2000, in Chippewa Falls, to Jennifer (Loiselle) and Kerry Hagen and graduated from Chi-Hi in 2018. Matthew played basketball and soccer from a very early age. He played basketball through middle school and with the Cardinal Hoops, a local traveling team. Matthew loved to play soccer though, and he continued to play right through high school; four years with the Chi-Hi Cardinals as well as playing for the Strikers, a local traveling soccer team. Matthew learned a lot from his coach and mentor, Mike Cohoon. Matthew loved to spend time outdoors, hammocking, camping at Winterhaven Resort, swimming, hiking, exploring and hanging out with his friends. He also enjoyed the time he spent with his dog, Stella; and his cat, Zoey. His grandpa Jon, his teachers, friends, neighbors, and basically anyone that knew Matthew, will always remember him as a loving, kind, polite, and caring young man, who cared deeply for his brothers. Even though he wasn’t able to get the matching “Three Brothers” tattoo that Michael and Mitchell have, he will always be in their hearts. Matthew will forever be loved and missed by his parents, Kerry and Jennifer Hagen; brothers, Michael (Beretta Todd) Hagen and Mitchell Hagen; maternal grandmother, Judi Folska-Witkowski; paternal grandparents, Jon and Joanne Hagen; aunts, uncles, and cousins, Jill (Mike) Trimbo and daughter, Kyrsten Snyder, Carla Witkowski, Jason (Christina) Witkowski, Cecil and Kelley Hayes and children, Daniel (McKenzee) and Abigale Hayes, Kevin and Marcy Hagen and children, Steven (Krystal) Hagen-Miller, Jessica, Alaina, Joshua, Anna, and Caleb Hagen, Kurtis and Jennifer Hagen and children, Johnathan Bucholtz, Jasmine (Ryan) Anderson, Kristi Hagen, Kalley Hagen, Kayelyn Hagen, Jacob Hagen, Brendon (Selena) Pawlak, Ethan Pawlak, Kerigan (Anthony) Pawlak; great-aunts and uncles, Cindi Folska and her children, Jeff and Jon Stumm, Curt (Connie) Folska and their daughter, McKenna Missfeldt, special Minnesota family “Nana” Carol Reardon, Kelly and Cory Denney and their children, Andrew and Alexa Denney; girlfriend, Bailey Zank; and many, many close friends, including his very special neighbors, Dale and Paula Slaby. He was preceded in death by his maternal grandfather, Phillip Loiselle; stepgrandfather, Gary Witkowski; cousin, Samuel Hayes; great-grandparents, Edward and Margaret Folska, Dale and Virginia Loiselle, William and Lila Askegaard, and Merton and Elaine Hagen. A funeral service will be held at 2 p.m. Monday, April 15, at Pederson-Volker Funeral Chapel, Chippewa Falls with Matthew’s uncle, Pastor Kevin Hagen, officiating. Visitation will be from 4 to 8 p.m. Sunday, and one hour prior to the service Monday at the funeral chapel. Dorothy E. Lowe Henneman, died peacefully Sunday, April 7, 2019, at Lake Hallie Memory Care at age 101. She lived alone and took care of all her own business, and drove her car until a year ago, when she broke her hip. Then she gratefully accepted help from her family and friends and was content with life. She was born Aug. 22, 1917, to Leslie and Eunice (Tait) Roycraft, in the town of Lafayette. She lived her entire life in the Chippewa Falls area, graduated from Cadott High School as valedictorian and attended class reunions for decades with her classmates in July. For 33 years, she worked at the Northern Center as an aide, and then as a cook. She was an active member of Trinity United Methodist Church. She sang with the choir and served the church faithfully in many areas, including helping in the kitchen, visiting shut-ins and delivering flowers to members. She was an active member of United Methodist Women and hosted many events there. Dorothy had a great group of friends who traveled together on an annual fishing trip to Canada. She loved to play cards and belonged to different card clubs over the years. She was a great cook and loved to bake, making wedding cakes for her grandchildren’s weddings, baby showers and other special gatherings. She was always ready to hop in her car to attend all family events and brought food with her. She enjoyed gardening and filled her shelves with canned produce. We all have favorite dishes that she prepared for us. Dorothy is survived by her daughter-in-law, Lana Lowe of Chippewa Falls; son-in-law, Ray Benedict of Butte des Morts, Wis.; grandchildren, Michael Lowe, Richard (Anna) Kurtz, Kelly Deppe, Sherry (Brian) Seaman, Jeffery (Katherine) Benedict; granddaughter-in-law, Cindy Lowe; great-grandchildren, Brooke and Hailey Lowe, Krystle (Lester) Kujawa, Emily and Samantha Deppe, Kevin (Daphne) Carley, Kelly (Josh) Werth, Kenny (Karen) Carley, Casey (Adam) Jenks, Ricky J. Kurtz, Andrea Denil, Michael Zelke, Destany, Abigail and Laura Benedict; great-great-grandchildren, Kaiden, Makenna, Holden and Maddlyn Jenks, Olivia, Logan, Mason and Eliana Carley, Ramona and Ivy Carley, Kevin and Jordan Carley, Sam, Lily Ann, Melanie Bell, Joshua, and Bethany Werth and Austin Kujawa; great-great-great-grandchild, Nervana Werth. She was preceded in death by her husbands, Alfred Lowe and Keith Henneman; son, Leonard Lowe; daughter, Linda Benedict; sister, Lucille (Arthur) Schwartz; brother, Donald Roycraft; grandson, Steven Lowe; and granddaughter, Carol Kurtz. A funeral service will be held at 11 a.m. Friday, April 12, at Trinity United Methodist Church, Chippewa Falls, with the Rev. Terri Koca officiating. Interment will be at Forest Hill Cemetery, Chippewa Falls at a later date. Visitation will begin at 10 a.m. Friday at the church.